Apart from the great location there are tons of other great features that you will enjoy. The furniture is all brand new and the apartment is beautifully decorated with comfortable furniture both inside and outside. 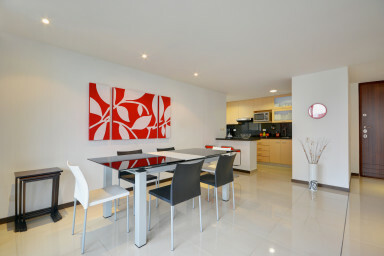 The other thing I love about this apartment is the amazing 20MB download speed, the fastest speed available for a residential building in Medellin, and the great home office setup which is perfect for our guests that need to stay connected and have a reliable, fast network environment. The spacious balcony has seating for four and offers a great view of the city, the swimming pool and the creek below. It’s really a very pleasant place to pass the time and enjoy the peace and quiet. The living room features a large flat screen TV with the full package of HD and English channels so you can watch the maximum number a channels available in this city. This is a great extra bonus that usually not available in other rentals. With two bedrooms and two bathrooms it’s has an ideal layout and very comfortable for one or two people (or couples). The kitchen offers a breakfast bar or a six seater dining room table for entertaining with friends. To top it all off there is a full washer dryer to get your laundry done as fast as possible and the building itself offers a great swimming pool, a fantastic playground for kids (including a recreation center) and a decent gym. It’s the perfect home for a family, a working traveler or anyone who values comfort and a restful vacation. This is one of our most popular apartments, so if you see it available, book it now! The use of the laundry area is an additional cost and is done by our maid. This apartment is ideally located close to some of the largest shopping malls in the city. This apartment is located in one of my favorite buildings in the city. It’s also one of the most sought after buildings due to its location close to some of the most popular shopping malls in the city and the main avenue in the city, but also due to the fact it’s on a quiet dead end street with virtually no noise and a lovely green view of a creek running in front of the building.